Before you throw out that old piece of leather furniture, Renew-It! 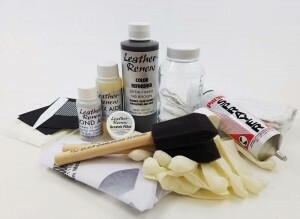 Make repairs to worn finishes, scratches, cracks, cigarette burns, and the like. Choose from two kits (small or large). The large kit contains 16 ounces of dye (enough to cover up to 96 square feet of surface area with three coats - this amount will refinish most seven foot, three seat, leather couches). The small kit contains 8 ounces of dye (enough to cover up to 48 square feet of surface area with three coats). ***These color chart samples are an approximation of the actual color. Colors may vary due to monitor resolution and personal settings.